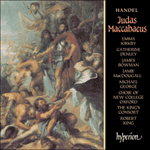 The Overture to Judas Maccabaeus is one of Handel’s greatest. The stately dotted rhythms, minor key and angular melodic leaps of the opening create a suitably solemn mood, leading into a superb fugue. The theme is based on one of Handel’s Italian duets, ‘Sono liete’, with the repeated semi-quaver rhythm apparently based on a theme in Telemann’s Musique de Table (from which Handel borrowed quite liberally). Winton Dean also makes a link with the warlike semi-chorus ‘Disdainful of danger’: certainly the mood is actively aggressive, the lines angular and extrovert. Handel’s scoring is masterly, for the fugue begins only with strings and harpsichord: the entry of the oboes, bassoons and organ in block chords at the mid-point is thrilling. A dramatic French-style dotted Lentement intervenes, the fugue is repeated again, but this time with a rapid ending which suggests that the composer is impatient to get on with the action. The opening chorus (of ‘Israelites, Men and Women, lamenting the death of Mattathias, father of Judas Maccabaeus’) is a fine one, graphically expressive in its picture of Mattathias’s solemn funeral procession, with the word ‘mourn’ set particularly poignantly, and ‘your hero is no more’ pointed by a repeated falling arpeggio. The Israelite Man and Woman continue the mournful mood in their recitative, for the Israelites’ fortunes are at a low ebb with the death of their leader. The duet ‘From this dread scene’ is more dramatic, the strings’ dotted rhythms and the wide-ranging vocal tessitura (taking the soprano to her lowest reaches and the mezzo-soprano to her highest) portraying the ‘boasted tow’rs’ of Solyma lying in ‘smoky ruins’. The funeral atmosphere returns with the stunning chorus ‘For Sion lamentation make’. Over minor chords from the upper strings and a falling, undulating bass line the bassoons are at their most plaintive, sighing in their upper register. The choir enter in a mournful barcarolle, the harmony is full of the richest suspensions and the alliteration of the words poignantly set: Handel is on superb form. Simon, one of Mattathias’s sons, enters, reasoning that such grief does not become God’s chosen race. Morell’s rather bizarre text for the Israelitish Man, ‘Pious orgies’, draws elegantly tuneful writing from the composer, and the Israelites’ confidence that their prayers will be answered is strengthened in the hymn-like opening to the chorus ‘Oh Father, whose almighty pow’r’, turning at the midpoint into a confident fugue ‘And grant a leader bold and brave’. Simon returns with a brisk accompagnato ‘I feel the Deity within’ in which he points out his brother Judas as the next leader of Israel. In the air ‘Arm, arm ye brave’ he stirs his fellows into action (with some delightful doubling of the voice by the bassoon), driving the Israelites into a lively chorus ‘We come in bright array’. The words are pointed by the orchestra’s driving fanfares: the insistent block chord repetitions of ‘Judah’ are especially powerful. Judas responds with the dramatic air ‘Call forth thy powr’s’, full of runs for both orchestra and soloist, and containing a contrasting middle section ‘Great is the glory’. Next, more for musical contrast than dramatic necessity, comes a series of four liberty airs, the first of which, ‘Oh liberty’, is scored for solo cello and continuo, with the tutti strings joining in for the affectionate playout. ‘Come ever smiling liberty’ proved to be a huge hit with audiences in 1748, being encored in mid-performance: it has all the charm and good melody that makes Handel’s simple arias so appealing. The Israelite Man’s response ‘’Tis liberty’ proved to be equally popular, being sung at Covent Garden four times in a month, and later even being arranged for barrel organ! The sequence ends with a reprise of ‘Come, ever smiling liberty’, now neatly turned into a duet, shortened and given a fuller orchestral texture. With the chorus ‘Lead on’ the warlike mood returns, and Judas fires up his troops with a dramatic accompagnato in which he resolves ‘on liberty or death’. The semi-chorus ‘Disdainful of danger’ is splendid: Handel scores it for men’s voices only, the rushing scales and repeated notes vividly representing the impetuous Israelite men in their ‘rush on the foe’: the phrase ‘that thy pow’r, oh Jehova’ rollicks along. Judas sets out his aims for victory and eventual peace in the air ‘No unhallow’d desire’, and the Act ends with the Israelite’s prayer ‘Hear us O Lord’, in which the smooth opening theme and the pleading repetitions of ‘hear us’ are contrasted with the more lively scalic movement as they, ‘resolv’d on conquest or a glorious fall’, go off to battle. At the start of Act II the Israelites are celebrating victory over invaders from Samaria (under Apollonius) and Syria (under Seron). ‘Fall’n is the foe’ is a splendid chorus, with a hugely energetic opening for the strings. The first choral phrase is fired amongst the voices like an arrow, occasionally interrupted by sudden hushes for the word ‘fall’n’. Towards the end of the movement, when fugue gives way to choral block chords, the choir are given a particularly thundrous unison orchestral accompaniment for ‘where warlike Judas wields his mighty sword’. The Israelite Man is provided with a virtuoso air ‘So rapid thy course is’, exploiting the agility of the voice and the extremes of its range and giving ample evidence of Caterina Galli’s vocal pyrotechnics. The duet ‘Sion now her head shall raise’ and the extensive chorus ‘Tune your harps’ into which it links were the last of Handel’s additions to the oratorio, with sumptous vocal and instrumental scoring, especially in the overlapping entries for the divided boys and the full wind scoring, full of passages of doubled thirds. 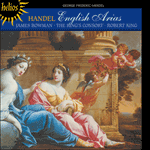 In her recitative ‘Oh let eternal honours’ the Israelitish Woman praises Judas’s courage in battle but in the following air ‘From mighty kings’, another gem, Handel chooses to stress the more gentle, smiling, side of the text in gloriously lilting writing for his soprano. The brief middle section ‘Judah rejoiceth in his way’ is a contrast in almost every way, brisk and busy in its runs. With the duet and chorus ‘Hail, Judea, happy land’, in the bright key of D major, the Israelites are now confident and happy. Judas reminds them that the victory came because heaven willed it so, and that it is to that quarter that they should ‘give your applause’. In setting Judas’s air ‘How vain is man’ some writers have suggested that Handel misunderstood the meaning of the word ‘vain’, interpreting ‘conceited’ rather than Morell’s intended ‘empty’: but Judas is a fiery, warlike character (and so was his English parallel Cumberland), and Handel makes play with the word ‘gigantic’ in another virtuoso test of his soloist. The middle section ‘And dreams not that a hand unseen’ is one of the few pieces of lyrical writing for Judas in the oratorio. The triumphant mood is rapidly broken by the messenger’s news of renewed war. Antiochus, King of Samaria, has sent a large force under Gorgias: once again there is a threat of war and the Israelites are thrown into depression. The air and chorus ‘Ah, wretched Israel’ is of the finest quality. The texture at the start is simple: a solo cello sets the despondent mood, and is then joined by a lamenting solo soprano. At the tutti strings’ entry, Handel (following the example of Purcell at moments of great tragedy) utilizes a ground bass. The entry of the chorus increases the pathos, with the word ‘wretched’ set with especial feeling: towards the end, the phrase ‘fall’n, how low’ is spread amongst the voices to devastating effect and the strings end the movement softly. Simon is left to reason that such events are sent not to destroy Israel, but to punish it for its misdemeanours against God. His splendid air ‘The Lord worketh wonders’ contains all the word-painting that one would expect, with rising phrases for ‘his glory to raise’, and especially graphic writing for the voice and the continuo section for ‘thunders’. The warlike Judas is immediately roused into making war against the Idumean governer, and Handel obliges with a marvellous solo and chorus, ‘Sound an alarm’. The temptation to bring in the full orchestra at the start is resisted: Judas’s first call to arms is answered by the continuo section (in our recording, every available bass instrument in the orchestra!). At the mid-point, Judas sounds his alarm again, and this time is rewarded by the entry of the whole orchestra: the trumpets and timpani play their first notes in the oratorio—what an exciting entry this is! Finally the chorus enter with ‘We hear the pleasing, dreadful call’, pulled along by the trumpets and timpani’s insistently driving fanfares. Faint respite is given by the sudden silence and drop in dynamics at ‘if to fall’ but the build-up through ‘for laws, religion, liberty, we fall’ is inexorable and the movement ends in a blaze of orchestral sound. Once again Simon is the calm voice of reason, calling a halt to the bellicose mood: whilst his brother is at war, he has to clean up the temple, which has been desecrated. In the beautiful air ‘With pious hearts’, his simple melody and the violins’ sighing cross-phrasing creates a mood of noble resignation. The Israelite Man and Woman too lend their support, hurling ‘polluted altars’ and other profane elements out of the temple. Handel’s 1758 addition to the score of ‘Wise men flatt’ring’ (based on a movement from nearly fifty years before in Agrippina) brings in a jewel. The scoring includes two horns, two flutes, two oboes and two bassoons, as well as strings, and with this variety of instruments at his disposal, Handel produces a wealth of glorious textures. The simple melody, lilting in its gentle triple time and accompanied by a rising triad which moves through all the orchestra, is a winner. The cleaning of the temple now completed, the Israelite Man and Woman state the resolve of the Israelites not to worship anyone but God in ‘We never will bow down’ (with some of Morell’s most trite words), and their melody is taken up by the chorus before Handel resorts, as he often does in moments of a weak libretto, to a fugue to close the Act. The key changes from minor to major, and the composer gives added impact by utilizing a double fugue. Striking block chords characterize the first subject (almost an inversion of Bach’s famous ‘St Anne’ theme) which continues throughout the movement in long notes in at least one of the voice parts: against this is heard the second fugal subject, more rhythmically lively. The Act ends with the Israelites’ defiant affirmation of their strong belief in God. 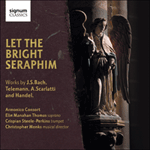 For the gentle celebration of the Feast of Lights which opens the third Act, Handel produced a masterpiece. ‘Father of Heaven’ is every bit as great a melody as ‘Ombra mai fu’. From the first notes of the string introduction the music flows gracefully, beautifully scored and gloriously serene: leaving the singer’s first phrase unaccompanied was a masterstroke. Handel’s principal cellist must have relished his ravishing continuo line! The middle section, for a change, does not go to the minor. Instead, with ‘And thus our grateful hearts employ’ the voice is encouraged into its upper reaches. The quiet return to the opening section is spellbinding—even with the most unsophisticated Handelian audience there surely cannot have been a dry eye in the house! The Israelite Man takes the rising incense from the altar to be a sign that God has heard the prayers, and the Israelite Woman prays that peace will descend on Israel. Her air ‘So shall the lute and harp awake’ is a delight, the references to the musical instruments of heaven inspiring Handel in much the same way as they did the next year in ‘Oh had I Jubal’s lyre’. The extended middle section provides lyrical contrast to the light jollity of the outer sections, full of neat runs and the glorious harmonic sequences which made Handel’s writing so immediately attractive and accessible to his audiences. A breathless alto messenger brings the good news from Capharsalama that Judas has routed the enemy in their thousands (elephants and all!) and, introduced by a second messenger, the hero enters Jerusalem in triumph. In 1748 ‘See the conqu’ring hero comes’ had not yet been written, and the music moved straight into ‘Sing unto God’, but the huge success of the chorus when premiered in Joshua the next year ensured its immediate inclusion for ever after. Handel’s procession is headed by a ‘Chorus of Youths’ (accompanied by organ and two obbligato horns), followed by a ‘Chorus of Virgins’ (flutes and organ). For the third verse the whole orchestra and choir combine, with the military drummer instructed to play ‘ad libitum, the second time warbling’ [ie tremelo]. The lively March that follows (originally placed in Act II) was borrowed from a keyboard piece in Georg Muffat’s Componimenti of 1735. The chorus ‘Sing unto God’ is an example of Handel’s ceremonial writing at its best: this is a chorus which could just as easily be from one of the Coronation Anthems. In the bright key of D two soloists joyfully start the movement before the choral and orchestral forces combine, the block chords of ‘Sing unto God’ alternating with Handel’s inimitable runs, all punctuated by triumphant trumpet fanfares. Judas, magnanimous in victory, orders a halt to the celebrations whilst warriors are decently buried. Morell gets near the ridiculous in his special mention of Eleazar: apparently going one better than Acis (whom we remember was crushed beneath Polyphemus’s stone), this warrior hero ‘triumphed in a glorious death’, squashed in battle under a fallen elephant! Judas’s air ‘With honour let desert be crown’d’ is remarkable for its use of a trumpet obbligato in A minor—one of very few pieces in the eighteenth century for the instrument written in a minor key, and certainly Handel’s only example. If ever proof was needed of the skill of eighteenth century trumpeters (for the aria stayed in each performance for ten years), here would be a good example. Eupolomeus, the Jewish Ambassador to Rome, returns from a diplomatic mission to the Senate with the news that the Romans have agreed to protect Israel from further attacks. The chorus celebrate with a gentle hymn ‘To our great God be all the honour giv’n’, its sentiments enhanced by the use of a minor key. 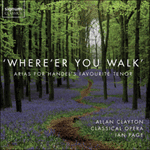 The Israelite Woman’s air, ‘O lovely peace’ brings in a pastoral mood: two flutes add their distinctive colours to the string texture, and Handel’s use of a drone bass and a gently rocking rhythm creates a delightfully tranquil scene. The scoring of the middle section, with ‘nature’s songsters’ twittering away in the violins, is glorious: Israel is now firmly at peace. It is left to Simon to introduce the final chorus, with a marvellous air, joyful yet noble, ‘Rejoice, oh Judah’. The choir enter fugally with their ‘Halleluia’ and then, in inspired writing, so do the trumpets, now stretching the first syllable of their Halleluia over nearly two bars. 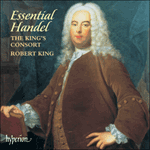 The full forces are at work, but Handel saves one more thrilling moment for the massive choral and orchestral chords that underlie ‘And in songs divine, harmonious join’. Little wonder when William Shenstone’s steward spoke for the masses in enthusing ‘with such ecstacy of the music’. Handel’s pocket was once again full, English pride restored—but did anyone spare a thought for the poor Scots? Haendel composa pour Judas Macchabée une de ses plus belles ouvertures. Les rythmes pointés majestueux, le ton mineur et les sauts mélodiques saccadés du début créent une atmosphère qui a toute la solennité appropriée et mènent à une fugue superbe. Le fondement du thème est un des duos italiens de Haendel, «Sono liete» et le rythme répété en double-croches est apparemment basé sur un thème qui provient de Musique de Table de Telemann (œuvre à laquelle Haendel emprunta délibérément). Winton Dean trouve aussi un lien avec le demi-chœur martial «Disdainful of danger» (Indifférents au danger): l’humeur est certainement activement agressive, les lignes saccadées et extraverties. L’orchestration est composée de main de maître, car la fugue commence seulement avec cordes et clavecin. L’entrée, au centre, des hautbois, bassons et orgue en accords bloqués est saisissante. Un dramatique Lentement pointé à la française intervient, la fugue est répétée de nouveau, mais cette fois-ci avec une fin rapide qui suggère que le compositeur avait hâte de passer à autre chose. Le chœur initial (d’«Israélites, hommes et femmes, pleurant la mort de Mattathias, père de Judas Macchabée») est très beau, graphiquement expressif dans sa description de la solennelle procession funèbre, avec le mot «mourn» (pleurez) mis en musique de façon particulièrement poignante, et «your hero is no more» (votre héros n’est plus) souligné par un arpège descendant répété. L’homme et la femme israélites conservent l’humeur funèbre dans leur récitatif, car les Israélites ne sont guère optimistes pour l’avenir, après la mort de leur chef. Le duo «From this dread scene» (Devant cette scène terrifiante) est plus dramatique: les rythmes pointés des cordes et la large étendue de la tessiture vocale (menant la soprano dans ses notes les plus basses et la mezzo-soprano dans ses plus hautes) décrivent des «boasted tow’rs» (les tours dont tu étais si fière) de Solyma s’effondrant en «smoky ruins» (ruines fumantes). L’atmosphère funèbre revient avec le chœur saisissant «For Sion lamentation make» (Lamentez-vous pour Sion). Entendus au-dessus d’accords mineurs des cordes les plus hautes et d’une ligne basse ondulante et descendante, les bassons expriment les sons les plus plaintifs, qui deviennent des soupirs dans leur registre supérieur. Le chœur attaque avec une mélancolique barcarolle, l’harmonie abonde des plus riches suspensions et l’allitération des paroles est mise en musique de la façon la plus poignante: Haendel est en pleine forme. Entre Simon, un des fils de Mattathias, raisonnant qu’un tel chagrin n’est pas digne de la race choisie de Dieu. Le texte plutôt bizarre de Morell pour l’homme israélite «Pious orgies» (Pieux excès) inspire une élégante écriture mélodique au compositeur et la certitude des Israélites de recevoir une réponse à leurs prières est renforcée par l’hymne par lequel le chœur débute: «Oh, Father, whose almighty pow’r» (Oh Père, dont la toute puissance). Celui-ci se transforme au point central en une fugue assurée «And grant a leader bold and brave» (Et accorde-leur un chef courageux et audacieux). Simon revient avec un accompagnato vivement mené «I feel the Deity within» (Je sens la Divinité en moi) dans lequel il désigne son frère Judas comme le chef successeur d’Israël. Dans la mélodie «Arm, arm ye brave» (Aux armes, mes braves, aux armes) il incite ses compagnons à l’action (le basson double la voix de façon délicieuse par moments), les menant dans un chœur animé «We come in bright array» (Nous voici, en rangs tous prêts …). Les paroles sont soulignées par les fanfares impérieuses de l’orchestre: les répétitions insistantes d’accords bloqués de «Judas» sont tout particulièrement émouvantes. Judas répond avec la dramatique mélodie «Call forth thy pow’rs» (Rassemble tes forces), où abondent des roulades pour orchestre et soliste, et contenant une section centrale contrastante, «Great is the glory» (Grande est la gloire). Vient ensuite, davantage pour contraste musical que par nécessité dramatique, une série de quatre airs patriotiques dont le premier, «Oh liberty» est orchestré pour violoncelle solo et continuo, avec l’ensemble des cordes se joignant à eux pour le tendre dénouement. «Come, ever smiling liberty» (Viens liberté au sourire sans fin) eut un immense succès auprès du public de 1748, et fut bissé en pleine représentation: il avait tout le charme et l’excellente mélodie qui rendent les arias de Haendel si émouvantes. La réponse de l’homme israélite «’Tis liberty» s’avéra tout aussi populaire; elle fut chantée à Covent Garden quatre fois en un mois, et fut même adaptée plus tard pour orgue de Barbarie. La séquence se termine avec une reprise de «Come, ever smiling liberty» maintenant adroitement transformée en duo, raccourcie et avec une texture instrumentale plus étoffée. Avec le chœur «Lead on» (En avant), l’humeur martiale revient, et Judas enflamme ses troupes avec un accompagnato dramatique dans lequel il se résout «on liberty or death» (la liberté ou la mort). Le demi-chœur «Indifférents au danger» est splendide. Haendel l’orchestre pour voix d’hommes seulement, les gammes effrénées et les notes répétées représentant de façon colorée les Israélites impétueux «se précipitant sur l’ennemi» (nous attaquerons l’ennemi»): la phrase «Oh Jéhovah, ton pouvoir» semble exubérante. Judas explique ses plans pour la victoire et la paix qui la suivrait dans l’air «No unhallow’d desire» (Aucun désir impie), et l’acte se termine sur la prière des Israélites «Hear us, Oh Lord» (Entends notre prière, Oh Seigneur), dans laquelle l’harmonieux thème initial et les répétitions implorantes du mot «Entends» sont contrastés avec le mouvement montant plus animé de leur départ pour la bataille, «resolv’d on conquest or a glorious fall» (résolus à vaincre ou à mourir glorieusement). Au début du deuxième acte, les Israélites célèbrent leur victoire sur les envahisseurs de Samarie, que commande Apollonius, et de Syrie (sous les ordres de Séron). «Fall’n is the foe» (L’ennemi est vaincu) est un merveilleux chœur, qui donne aux cordes un début d’une immense vitalité. La première phrase vocale est décochée comme une flèche parmi les voix, interrompue de temps en temps par de soudains silences au mot «fall’n» (vaincu). Vers la fin du mouvement, quand la fugue fait place aux accords bloqués chantés, la musique donne au chœur des chanteurs un étourdissant accompagnement instrumental d’unisson pour «where warlike Judas wields his mighty sword» (quand le martial Judas brandit sa puissante épée). L’homme israélite a un passage virtuose «So rapid thy course is» (Si rapide est ta course), qui exploite l’agilité de la voix et les extrêmes de son étendue, donnant ample évidence de l’éblouissante voix de Caterina Galli. Le duo «Sion now her head shall raise» (Sion va maintenant relever le front) et l’important chœur «Tune your harps» (Accordez vos harpes) auquel il se rattache, furent les dernières additions de Haendel à l’oratorio, avec une somptueuse orchestration vocale et instrumentale, tout particulièrement dans les entrées chevauchantes pour les voix divisées des garçons et l’orchestration pour l’ensemble des bois, tout emplie de passages de tierces doublées. Dans son récitatif, «Oh let eternal honours» (Oh que des honneurs éternels), la femme israélite chante les louanges du courage de Judas dans la bataille, mais dans l’air qui suit, «From mighty kings» (De puissants souverains), qui est un chef d’œuvre, Haendel choisit d’accentuer le côté plus doux et souriant du texte avec une écriture glorieusement cadencée pour son soprano. La brève section centrale «Judah rejoiceth in his name» (La Judée honore son nom) est un contraste presque absolu, vif et plein de mouvement avec ses roulades. Avec le duo et le chœur «Hail, Judea, happy land» (Nous te saluons, Judée, terre bienheureuse) qui est dans le vif ton de ré, les Israélites sont maintenant rassurés et heureux. Judas leur rappelle que la victoire a été obtenue grâce à la volonté du ciel et que c’est à celui-ci qu’ils devraient adresser leurs remerciements «Give your applause» (Adressez vos acclamations). Certains auteurs prétendent que lorsqu’il mit en musique l’air de Judas «How vain man is» (Comme il est présomptueux celui qui se vante) Haendel avait mal compris la signification du mot «vain», l’interprétant comme vaniteux plutôt que «futile» comme c’était l’intention de Morell: mais Judas est un personnage fougueux, guerrier (tout comme son parallèle anglais Cumberland), et Haendel joue avec le mot «gigantic» (gigantesque) dans un autre test virtuoso pour son soliste. La section centrale «And dreams not that a hand unseen» (Et ignore qu’une main invisible) est un des rares passages d’écriture lyrique pour Judas dans l’oratorio. Pourtant, l’humeur triomphante est rapidement interrompue par le messager qui apporte les nouvelles de la reprise de la guerre. Antiochus, roi de Samarie, a envoyé une grande armée sous les ordres de Gorgias: il y a une fois encore menace de guerre et les Israélites retombent dans le désespoir. La mélodie et le chœur «Ah, wretched Israel» (Ah, malheureuse Israël) sont très beaux. La texture au début est simple: un violoncelle solo crée l’atmosphère découragée, puis les lamentations d’une soprano solo se joignent à lui. A l’entrée de toutes les cordes, Haendel (suivant l’exemple de Purcell aux moments de grande tragédie) utilise une basse obstinée. L’entrée du chœur augmente le pathétique, avec le mot «wretched» (malheureuse) mis en musique avec une sensibilité toute particulière: vers la fin, la phrase «fall’n, how low» (tombée si bas) s’épanche parmi les voix d’une façon accablante et les cordes terminent le mouvement en douceur. C’est à Simon qu’échoit le rôle d’expliquer que de tels événements ne sont pas envoyés pour détruire Israël, mais pour la punir de ses fautes envers Dieu. L’air splendide qu’il chante «The Lord worketh wonders» (Le Seigneur accomplit des miracles) contient toute l’imagerie que l’on attend de Haendel, avec des phrases ascendantes pour «his glory to raise» (chanter sa gloire) et une écriture particulièrement graphique pour la voix et la section continuo pour le mot «thunders» (montre sa colère). Le belliqueux Judas est immédiatement prêt à partir en guerre contre le gouverneur d’Idumée, et Haendel lui donne un merveilleux solo et chœur, «Sound an alarm» (Sonnez l’alerte). Il résiste à la tentation d’introduire l’orchestre tout entier au début. Le premier appel aux armes de Judas a pour réponse la section continuo (dans notre enregistrement, cela représente tous les instruments de basse dont nous disposions!). Au point central, Judas sonne l’alerte une fois encore et cette fois-ci, il est récompensé par l’entrée de l’orchestre entier: les trompettes et les timbales jouent leurs premières notes de l’oratorio—quelle entrée passionnante! Finalement le chœur entre avec «We hear the pleasing, dreadful call» (Nous entendons le bienvenu et terrifiant appel) suivant les fanfares des trompettes et timbales à l’insistance impérieuse. Le silence soudain et la baisse de dynamique donnent un bref répit à «if to fall» (s’il faut mourir) mais l’intensification à travers «for laws, religion, liberty, we fall» (pour nos lois, religion, liberté, nous mourrons) est inexorable et le mouvement se termine dans une explosion de sons instrumentaux. Une fois encore la voix de Simon est celle de la raison, qui veut arrêter l’humeur belliqueuse: pendant que son frère est à la guerre, il doit purifier le temple, qui a été profané. Dans le bel air «With pious hearts» (de cœurs pieux), sa simple mélodie et le phrasé croisé des soupirs des violons créent une atmosphère de noble résignation. Le duo de l’homme et la femme israélites y ajoute aussi, lorsqu’ils jettent «les autels profanés» («polluted altars») et autres éléments impies hors du temple. L’addition de Haendel de 1758 à la partition de «Wise men flatt’ring» (basé sur un mouvement datant presque de cinquante ans et tiré d’Agrippina) introduit un chef d’œuvre. L’orchestration comprend deux cors, deux flûtes, deux hautbois et deux bassons, en même temps que les cordes et avec cette variété d’instruments à sa disposition, Haendel produit une profusion de magnifiques textures. La simple mélodie, cadencée dans son trois temps raffiné et accompagnée d’un accord parfait ascendant qui passe par tout l’orchestre, est magnifique. La purification du temple est terminée, l’homme et la femme israélite expriment la décision des Israélites de n’adorer que Dieu dans «We never will bow down» (Nous ne nous prosternerons jamais)—dans le vocabulaire le plus banal de Morell. Leur mélodie est reprise par le chœur avant que Haendel n’ait recours—comme il le fait souvent dans des moments de livret banal—à une fugue pour terminer l’acte. Le ton change de mineur en majeur et le compositeur ajoute un effet supplémentaire en utilisant une double fugue. De remarquables accords bloqués caractérisent le premier sujet (qui est presque une inversion du fameux thème «Sainte Anne» de Bach), qui continue à travers tout le mouvement en longues notes dans une au moins des parties vocales: c’est le fond sur lequel s’entend le second sujet fugué, plus animé rythmiquement. L’acte se termine avec l’affirmation défiante des Israélites de leur inébranlable foi en Dieu. Haendel composa un chef d’œuvre pour l’élégante Fête des Lumières qui ouvre le troisième acte. «Father of Heaven» (Père des Cieux) est une mélodie aussi magnifique que «Ombra mai fu». Dès les premières notes de l’introduction par les cordes, le flot de la musique coule gracieusement, avec une merveilleuse orchestration et une magnifique sérénité: laisser la première phrase du chanteur sans accompagnement fut un coup de maître. La ravissante ligne continuo que Haendel donna à son premier violoncelliste doit avoir été un délice pour celui-ci! La section centrale, pour une fois, ne passe pas dans le mineur. Avec «And thus our grateful hearts employ» (Nos cœurs reconnaissants sont ainsi occupés …), la voix est au contraire encouragée à atteindre sa portée la plus haute. Le paisible retour à la section initiale est envoûtant—même parmi des auditeurs les moins sophistiqués, l’émotion devait être à son comble dans la salle! L’homme israélite interprète les volutes d’encens qui s’élèvent de l’autel comme un signe que Dieu a entendu leurs prières et la femme israélite prie que la paix descende sur Israël. Son air «So shall the lute and harp awake» (Ainsi le luth et la harpe s’éveillent) est un délice, les références à des instruments de musique donnant à Haendel une inspiration semblable à celle qu’il aurait l’année suivante pour «Oh had I Jubal’s lyre» (Oh si j’avais la lyre de Jubal). La section centrale allongée fournit un contraste lyrique à la gaîté légère des sections extérieures, pleines de nettes roulades et les glorieuses séquences harmoniques qui rendent l’attrait de l’écriture de Haendel si immédiat et accessible à ses auditeurs. Un messager alto, hors d’haleine, apporte la bonne nouvelle de Capharsalama: Judas a mis l’ennemi en déroute (ils s’enfuient par milliers, hommes et éléphants!) et, annoncé par un second messager, le héros entre dans Jérusalem en triomphe. En 1748 «See the conqu’ring hero comes» (Voyez c’est le héros conquérant) n’avait pas encore été composé, et la musique passait directement dans «Sing unto God» (Adressons à Dieu), mais l’immense succès du chœur lors de la première de Josué, l’année suivante, assura son inclusion immédiate et définitive. La procession de Haendel est précédée d’un «Chœur de Jeunes Gens» (accompagnés par orgue et deux cors obbligato) suivi d’un «Chœur de Vierges» (flûtes et orgue). Pour la troisième strophe le chœur se joint à l’orchestre tout entier; le tambour militaire reçoit l’instruction de jouer «ad libitum, la seconde fois tremblotant» (c’est-à-dire trémolo). La Marche animée qui suit (elle était à l’origine dans l’acte II) était empruntée à un morceau pour clavier dans les Componimenti de 1735, de Georg Muffat. Le chœur «Adressons à Dieu» est un exemple de la meilleure écriture de circonstance de Haendel. C’est un chœur que l’on pourrait tout aussi bien trouver dans les hymnes du Couronnement. Deux solistes commencent le mouvement dans le vif ton de ré avant que les forces vocales et instrumentales ne s’unissent, les accords bloqués de «Sing unto God» alternant avec les inimitables roulades de Haendel, tout cela ponctué par de triomphantes fanfares de trompettes. Judas, magnanime dans la victoire, ordonne d’arrêter les célébrations pour enterrer les ennemis avec dignité. Morell frise le ridicule avec sa mention spéciale d’Eléazar: apparemment, surpassant Acis (qui, on se le rappelle fut écrasé sous le roc de Polyphème), ce héros guerrier «triumphed in a glorious death» (triomphant dans une mort glorieuse), écrasé par un éléphant dans la bataille! L’air de Judas «With honour let desert be crown’d» (Couronnons d’honneur le courage) est remarquable pour son utilisation d’une trompette obbligato en la mineur—un des très rares morceaux du dix-huitième siècle écrits pour cet instrument dans un ton mineur, et certainement le seul exemple que l’on trouve dans la musique de Haendel. Si on avait besoin d’une preuve de l’habileté des trompettes du dix-huitième siècle, il ne fait aucun doute que ce morceau constituerait un bon exemple (car l’aria a été incluse à chaque représentation pendant dix ans). Eupolémée, l’ambassadeur israélite à Rome, revient d’une mission diplomatique au Sénat avec la nouvelle que les Romains ont accepté de protéger Israël contre de futures attaques. Le chœur célèbre cette nouvelle avec un hymne mélodieux, «To our great God be all honour giv’n» (Rendons au Dieu tout puissant tous les honneurs), dont le ton mineur met en valeur les sentiments. L’air de la femme israélite «Oh lovely peace» (Oh douce paix) introduit une humeur pastorale: deux flûtes ajoutent leurs couleurs distinctives à la texture des cordes et l’utilisation par Haendel d’un bourdon et d’un rythme doucement cadencé crée une scène délicieusement tranquille. L’orchestration de la section centrale, avec les oiseaux («nature’s songsters») pépiant dans les violons, est magnifique. La paix règne maintenant sur Israël. Il reste à Simon à introduire le chœur final, avec un air merveilleux, joyeux mais noble, «Rejoice, Oh Judas» (Réjouis-toi, oh Judas). Le chœur entre discrètement avec son Alléluia, puis, dans une écriture inspirée, les trompettes font leur entrée aussi, faisant durer maintenant leur Alléluia sur presque deux mesures. Tout le chœur et l’orchestre participent à l’action, mais Haendel garde encore un moment palpitant pour les accords vocaux et instrumentaux qui forment le soutien de «And in songs divine, harmonious join» (Et unis-toi … Dans l’harmonie de chants divins). Il n’est pas étonnant que l'intendant de William Shenstone fut l’interprète du grand public lorsqu’il portait aux nues «la musique avec ravissement». Les poches de Haendel étaient de nouveau remplies, l’orgueil britannique était restauré—mais qui pensait aux pauvres Ecossais? Die Ouvertüre von Judas Maccabaeus ist eine der großartigsten, die Händel geschrieben hat. Die getragenen punktierten Rhythmen, die Molltonart und die jähen melodischen Sprünge der Eröffnung erzeugen eine angemessen feierliche Stimmung und münden in einer vorzüglichen Fuge. Das Thema ist „Sono liete“ entlehnt, einem von Händels italienischen Duetten, der Rhythmus aus wiederholten Sechzehnteln offensichtlich einem Thema aus Telemanns Musique de Table (bei der Händel recht freizügig Anleihen machte). Winton Dean macht außerdem auf den Zusammenhang mit dem kriegerischen Halbchor „Disdainful of danger“ aufmerksam: Auf jeden Fall wirkt die Stimmung bewußt aggressiv, die Stimmführung kantig und extrovertiert. Händels Instrumentierung ist meisterhaft, denn die Fuge beginnt nur mit Streichern und Cembalo. Der Einsatz der Oboen, der Fagotte und der Orgel in Blockakkorden mitten im Stück ist hinreißend. Ein dramatisch punktiertes Lentement im französischen Stil schaltet sich ein, und dann wird die Fuge wiederholt, nur diesmal mit einem raschen Schluß, der den Schluß zuläßt, daß der Komponist ungeduldig war und endlich loslegen wollte. Der erste Chor (der Israeliten männlichen und weiblichen Geschlechts, die den Tod von Mattathias beklagen, dem Vater des Judas Maccabaeus) besticht mit seiner anschaulich expressiven Darstellung von Mattathias’ feierlicher Grabprozession, wobei das Wort „mourn“ besonders ergreifend klingt und „your hero is no more“ durch ein wiederholtes abfallendes Arpeggio zugespitzt wird. Die Israelitin und der Israelit setzen in ihrem Rezitativ die traurige Stimmung fort, denn die Geschicke des Volkes Israel sind nun mit dem Tod ihres Anführers auf einem Tiefpunkt angelangt. Das Duett „From this dread scene“ erscheint dramatischer, und die punktierten Rhythmen der Streicher sowie der große Stimmumfang (der Sopran wird an den unteren, der Mezzosopran an den oberen Rand der jeweiligen Stimmlage herangeführt) illustrieren die hoch aufragende Pracht von Solyma, das in rauchenden Trümmern liegt. Die Trauerstimmung setzt mit dem überwältigenden Chor „For Sion lamentation make“ wieder ein. Über Mollakkorden der hohen Streicher und einer abwärts gerichteten, wogenden Baßlinie klingen die Fagotte in ihrem oberen Register besonders klagend und seufzend. Der Chor singt eine kummervolle Barkarole, die Harmonik weist eine Fülle dicht gefügter Vorhalte auf und die Alliteration des Textes ist ergreifend umgesetzt: Das ist Händel in Hochform. Simon, einer von Mattathias’ Söhnen, tritt auf und sucht die Anwesenden zu überzeugen, das dieser Jammer Gottes auserwähltem Volk nicht geziemt. „Pious orgies“, Morells recht bizarrer Text für den Israeliten, veranlaßt den Komponisten zu einer melodisch eleganten Vertonung, und das Vertrauen der Israeliten, daß ihre Gebete erhört werden, wird in der hymnischen Eröffnung des Chors „Oh Father, whose almighty pow’r“ bestärkt, die mittendrin bei „And grant a leader bold and brave“ in eine zuversichtliche Fuge übergeht. Simon antwortet mit „I feel the Deity within“, einem forschen Accompagnato, in dessen Verlauf er seinen Bruder Judas als nächsten Herrscher Israels benennt. Mit der Arie „Arm, arm ye brave“ stachelt er seine Landsleute zum Handeln auf (gelegentlich reizvoll verdoppelt durch das Fagott) und veranlaßt die Israeliten, einen lebhaften Chor anzustimmen: „We come in bright array“. Seine Worte werden von den drängenden Fanfaren des Orchesters hervorgehoben; besonders eindrucksvoll sind die insistenten akkordischen Wiederholungen des Wortes „Judah“. Judas setzt die dramatische Arie „Call forth thy pow’rs“ dagegen, die voller Läufe für Orchester und Solisten steckt und bei „Great is the glory“ über einen kontrastierenden Mittelteil verfügt. Eher wegen des musikalischen Kontrasts als aus dramatischer Notwendigkeit schließt sich nun eine Folge aus vier Arien zum Thema Befreiung an, deren erste, „Oh liberty“, für Solocello und Continuo angelegt ist und die Tutti-Streicher erst beim herzlichen Ausklang mit einstimmen läßt. „Come ever smiling liberty“ war 1748 ein derart großer Publikumserfolg, daß es mitten in der Vorstellung wiederholt werden mußte: Es besitzt den ganzen Charme und die gelungene Melodik, die Händels schlichte Arien so ansprechend macht. „’Tis liberty“, die Antwort des Israeliten, erwies sich als ebenso populär; sie wurde in Covent Garden in einem Monat viermal dargeboten und später sogar für Drehorgel bearbeitet! Die Folge endet mit einer Reprise von „Come, ever smiling liberty“, nun geschickt in ein Duett umgewandelt, gekürzt und mit volleren Orchesterstrukturen versehen. Mit dem Chor „Lead on“ kehrt die kriegerische Stimmung zurück, und Judas feuert seine Soldaten mit dem dramatischen Accompagnato an, in dem er auf Freiheit oder Tod setzt. Der Halbchor „Disdainful of danger“ ist einfach herrlich. Händel hat ihn nur mit Männerstimmen besetzt, und die flinken Läufe und wiederholten Noten stellen die ungestümen Israeliten in ihrer Verfolgung des Feindes lebhaft dar; die Phrase „That thy pow’r, oh Jehova“ tollt ausgelassen nebenher. Judas legt in der Arie „No unhallow’d desire“ seine Pläne für den Sieg und anschließenden Friedensschluß dar, und der Akt endet mit „Hear us, O Lord“, dem Gebet der Israeliten, in dem das geschmeidige Eröffnungsthema und das flehentlich wiederholte „Hear us“ von den lebhafter gestimmten Läufen abgehoben wird, mit denen sie zu Sieg oder Tod entschlossen in die Schlacht ziehen. Am Beginn des II. Akts feiern die Israeliten den Sieg über Invasoren aus Samaria (unter Apollonius) und Syrien (unter Seron). „Fall’n is the foe“ ist ein prächtiger Chor mit einer äußerst kraftvollen Einleitung für die Streicher. Die erste Chorphrase wird wie ein Pfeil zwischen den Stimmen hin- und hergeschleudert, unterbrochen von plötzlichen leisen Tönen beim Wort „fall’n“. Gegen Ende des Satzes, wenn Fugalkomposition chorischen Akkordblöcken weicht, läßt das Orchester dem Chor bei „Where warlike Judas wields his mighty sword“ eine besonders donnernde Unisonobegleitung zukommen. Für den Israeliten ist „So rapid thy course is“ vorgesehen, eine virtuose Arie, welche die Wendigkeit der Stimme und die Extreme ihres Umfangs ausnutzt und reichlich Beweise für Caterina Gallis gesanglichen Feuerzauber liefert. Das Duett „Sion now her head shall raise“ und die lange Chornummer „Tune your harps“, mit der es verbunden ist, waren die letzten von Händels Zusätzen zum vorliegenden Oratorium; sie zeichnen sich durch üppige Vokalbesetzung und Instrumentierung aus, speziell in den überlappenden Einsätzen der aufgeteilten Knabenstimmen und dem umfassenden Bläsereinsatz voller Passagen mit verdoppelten Terzen. In ihrem Rezitativ „Oh let eternal honours“ preist die Israelitin Judas’ Tapferkeit in der Schlacht, während sich Händel in der nachfolgenden Arie „From mighty kings“, einem weiteren Juwel, darin gefällt, mit glanzvoll trällernder Stimmführung seines Soprans den sanfteren, lieblichen Aspekt des Textes hervorzuheben. Der kurze Mittelteil „Judah rejoiceth in his way“ bildet in fast jeder Hinsicht einen Kontrast und wirkt mit seinen Läufen flink und geschäftig. Im Duett und Chor „Hail, Judea, happy land“ in der strahlenden Tonart D-Dur geben sich die Israeliten nun zuversichtlich und glücklich. Judas aber erinnert sie daran, daß der Sieg errungen worden sei, weil der Himmel es so gewollt habe, und daß sie in diese Richtung ihren Beifall zu zollen hätten. Einige Autoren haben behauptet, daß Händel bei der Vertonung von Judas’ Arie „How vain is man“ die Bedeutung des Wortes „vain“ [eitel] mißverstanden und es als „dünkelhaft“ interpretiert habe, also nicht wie von Morell gemeint im Sinne von „nichtig“. Aber Judas ist (wie sein englisches Gegenstück Cumberland) ein feuriger, kriegerischer Charakter, und Händel nutzt die Gelegenheit, in einer weiteren virtuosen Bewährungsprobe für seinen Solisten das Wort „gigantic“ hervorzuheben. Der Mittelteil „And dreams not that a hand unseen“ ist eines der wenigen lyrischen Stücke für Judas im ganzen Oratorium. Die Triumphstimmung wird rasch aufgehoben, als der Bote meldet, daß der Krieg noch nicht vorbei ist. Antiochus, der König von Samaria, hat eine große Streitmacht unter Gorgias ausgesandt; es droht wieder Krieg, und die Israeliten versinken in Melancholie. Arie und Chor „Ah, wretched Israel“ sind von höchster Güte. Anfangs ist die Struktur ganz schlicht: Ein Solocello gibt die verzagte Stimmung wieder, und dann gesellt sich ein klagender Solosopran hinzu. Beim Einsatz der Tuttistreicher bietet Händel (nach dem Vorbild Purcells in Augenblicken großer Tragik) eine ostinate Baßlinie auf. Der Einsatz des Chors verstärkt das Pathos, wobei das Wort „wretched“ besonders gefühlsgeladen erscheint. Gegen Ende wird die Phrase „Fall’n, how low“ mit vernichtender Wirkung auf die Stimmen verteilt, und die Streicher lassen den Satz leise ausklingen. Simon bleibt zurück, um die Überlegung anzustellen, daß solche Ereignisse nicht vom Himmel gesandt seien, um Israel zu vernichten, sondern um es wegen seiner Vergehen gegen Gott zu strafen. Seine treffliche Arie „The Lord worketh wonders“ enthält erwartungsgemäß viel Klangmalerei, samt ansteigenden Phrasen bei „his glory to raise“ und besonders anschaulicher Musik für die Gesangsstimme und donnernder Continuogruppe auf „thunders“. Der kriegerische Judas ist sogleich bei der Hand, gegen den idumäischen Herrscher anzutreten, und Händel ist ihm mit „Sound an alarm“ gefällig, einem wunderbaren Solo und Chor. Der Versuchung, gleich zu Beginn das ganze Orchester einzusetzen, widersteht er. Judas’ erster Ruf zu den Waffen wird mit einer Continuopassage beantwortet (in unserer Aufnahme gespielt von allen verfügbaren Baßinstrumenten des Orchesters!). Auf halbem Wege läßt Judas sein Signal erneut erklingen und wird diesmal mit dem Aufmarsch des gesamten Orchesters belohnt: Die Trompeten und Pauken spielen zum ersten Mal im Oratorium eine Note—was für ein aufregender Einsatz dabei herauskommt! Schließlich kommt mit „We hear the pleasing, dreadful call“ auch noch der Chor hinzu, mitgerissen von den hartnäckig drängenden Fanfaren der Trompeten und Pauken. Eine leichte Atempause gewährt die jähe Stille und abfallende Dynamik bei „If to fall“, aber der erneute Aufbau bei „For laws, religion, liberty, we fall“ ist unausweichlich, und der Satz endet in einem Ausbruch des Orchesters. Wieder ist Simon die ruhige Stimme der Vernunft, die der Kampfesstimmung Einhalt gebietet: Während sein Bruder Krieg führt, muß er im Tempel aufräumen, der entweiht worden ist. In der schönen Arie „With pious hearts“ erzeugen seine einfache Melodie und die seufzende gegenläufige Phrasierung der Violinen eine Atmosphäre edler Resignation. Der Israelit und die Israelitin packen mit an und werfen die entweihten Altäre und andere profane Gegenstände aus dem Tempel. „Wise men flatt’ring“, Händels 1758 vorgenommene Ergänzung der Partitur (auf der Grundlage eines fast fünfzig Jahre zuvor entstandenen Satzes von Agrippina), fügt ein Juwel hinzu. Zur Besetzung gehören außer den Streichern zwei Hörner, zwei Flöten, zwei Oboen und zwei Fagotte, und mit dieser reichen Auswahl an Instrumenten schafft Händel eine Fülle märchenhafter Klanggebilde. Die schlichte Melodie, die in gemächlichem Dreiertakt dahinträllert und von einem ansteigenden Dreiklang begleitet wird, der sich durch das ganze Orchester fortsetzt, ist unübertrefflich. Nach vollendeter Säuberung des Tempels bekunden der Israelit und die Israelitin in „We never will bow down“ die Entschlossenheit des Volkes Israel, keinem anderen zu huldigen als Gott (Morells Text ist hier besonders platt). Dann wird ihre Melodie vom Chor aufgegriffen, ehe Händel wie so oft, wenn ein Libretto schwache Momente hat, Zuflucht zu einer Fuge nimmt, um den Akt zu beenden. Die Tonart wechselt von Moll nach Dur, und der Komponist sorgt mit einer Doppelfuge für zusätzliche Stoßkraft. Eindrucksvolle Blockakkorde kennzeichnen das erste Subjekt (fast eine Inversion von Bachs berühmtem Thema aus dem Präludium und Fuge in Es-Dur), das sich mit langen Noten jeweils in mindestens einem der Gesangsparts durch den ganzen Satz zieht; dagegen tönt das rhythmisch lebhaftere zweite Fugensubjekt an. Der Akt endet mit der trotzigen Bekräftigung ihres starken Glaubens an Gott durch die Israelitin. Für die geruhsame Feier zum Fest des Lichts, die den dritten Akt einleitet, hat Händel ein Meisterwerk geschaffen. „Father of Heaven“ ist in jeder Hinsicht eine ebenso großartige Melodie wie „Ombra mai fu“. Von den ersten Noten der Streicherintroduktion an fließt die Musik anmutig dahin, überaus schön instrumentiert und wunderbar heiter. Die erste Gesangsphrase unbegleitet zu lassen, war ein Geniestreich. Händels erster Cellist muß entzückt gewesen sein von seiner hinreißenden Continuolinie! Der Mittelteil wendet sich zur Abwechslung einmal nicht nach Moll. Statt dessen wird bei „And thus our grateful hearts“ die Stimme ermutigt, ihre höchsten Höhen anzusteuern. Die ruhige Rückkehr zur Eröffnung ist faszinierend—selbst beim umgebildesten Publikum kann damals kein Auge im Saal trocken geblieben sein! Der Israelit deutet den vom Altar aufsteigenden Weihrauch als Zeichen daß Gott die Gebete erhört hat, und die Israelitin betet darum, daß Frieden in Israel einkehren möge. Ihre Arie „So shall the lute and harp awake“ ist eine Wonne, und der Verweis auf die Musikinstrumente des Himmels hat Händel auf ähnliche Weise inspiriert wie ein Jahr später im Fall von „Oh had I Jubal’s lyre“. Der längere Mittelteil sorgt für lyrischen Kontrast zur leichten Fröhlichkeit der Eckpassagen; er weist eine Vielzahl prägnanter Läufe auf, sowie jene fabelhaften Harmoniefolgen, die Händels Kompositionen für sein Publikum so anziehend und zugänglich machten. Ein atemloser Alt überbringt die frohe Botschaft aus Kapharsalama, daß Judas den Feind (mitsamt seinen Elefanten!) zu Tausenden verjagt hat. Dann hält, von einem zweiten Boten angekündigt, der Held persönlich Einzug in Jerusalem. 1748 war „See the conqu’ring hero comes“ noch gar nicht geschrieben, und die Musik leitete direkt in „Sing unto God“ über, aber der gigantische Erfolg des Chors, als er im folgenden Jahr im Rahmen von Joshua Premiere hatte, stellte seine sofortige Eingliederung und seinen Verbleib in Judas Maccabaeus sicher. Händels Prozession wird von einem „Chor der Jünglinge“ angeführt (begleitet von Orgel und zwei Obligatohörnern); es folgt ein „Chor der Jungfrauen“ (Flöten und Orgel). Beim dritten Vers kommen das ganze Orchester und der Chor zusammen und die Militärtrommler erhält die Anweisung, „ad libitum, beim zweiten Mal trillend“ (d.h. Tremolo) zu spielen. Der zündende Marsch, der sich anschließt (er war ursprünglich im II. Akt plaziert), ist einem Klavierstück aus Georg Muffats Componimenti von 1135 entlehnt. Der Chor „Sing unto God“ ist ein besonders gutes Beispiel für Händels zeremoniellen Kompositionsstil. Dieser Chor könnte ohne weiteres aus einem der Coronation Anthems stammen. In der hellen Tonart D-Dur nehmen zwei Solisten freudig den Satz in Angriff, ehe sich Chor und Orchester zusammentun und die vollen Akkorde von „Sing unto God“ mit Händels unvergleichlichen Läufen abwechseln lassen, unterstrichen durch triumphierende Trompetenfanfaren. Judas, großherzig selbst noch im Sieg, befiehlt die Unterbrechung der Feierlichkeiten, während gefallene Krieger mit Anstand begraben werden. Morell gerät mit seinem Verweis auf Eleazar an den Rand des Lächerlichen Dieser Held, der offenbar Acis übertreffen sollte (Acis, wir erinnern uns, wurde von Polyphemus’ Fels zerschmettert), wurde un der Schlacht von einem fallenden Elefanten erschlagen! Judas’ Arie „With honour let desert be crowned“ ist bemerkenswert wegen des Einsatzes einer Obligato-Trompete in a-Moll—es ist dies eines von ganz wenigen Stücken in Moll die für das Instrument im 18. Jahrhundert geschrieben wurden und mit Sicherhat das einzige von Händel. Wenn je ein Beweis für das Können der Trompeter des 18. Jahrhunderts nötig war (die Arie wurde zehn Jahre lang bei jeder Aufführung dargeboten), wäre dies ein gutes Anschauungsbeispiel. Eupolomeus, der jüdische Gesandte in Rom, kehrt von einer diplomatischen Mission beim Senat mit der Nachricht zurück, daß die Römer eingewilligt haben, Israel vor weiteren Angriffen zu beschützen. Der Chor feiert das Ereignis mit der gelinden Hymne „To our great God be all the honour giv’n“, und seine Empfindungen werden durch die Verwendung der Molltonart betont. „O lovely peace“, die Arie der Israelitin, löst pastorale Stimmung aus: Zwei Flöten fügen dem Streichergewirk ihre typische Klangfarbe bei, und Händels Hinzunahme eines tiefen Borduns und sanft wiegender Rhythmen schafft eine reizvoll friedliche Atmosphäre. Die Instrumentierung des Mittelteils, in dem Vogelsang in den Violinen draufloszwitschert, ist einfach grandios. Israel hat nun endgültig Frieden gefunden. Es bleibt Simon überlassen, mit „Rejoice, oh Judah“, eine wunderbaren Arie, den Schlußchor einzuleiten. Der Chor stimmt fugal sein „Halleluja“ an, und dann tun es ihm die genial geführten Trompeten nach, dehnen die erste Silbe ihres Halleluja jedoch über fast zwei Takte aus. Sämtliche Beteiligten sind nun am Werk, aber Händel spart noch einen letzten spannenden Moment für die massiven Akkorde von Chor und Orchester auf, die „And in songs divine, harmonious join“ zugrundeliegen. William Shenstones Verwalter hat wohl für die Masse des Publikums gesprochen, als er sich über „soviel Ekstase in der Musik“ begeisterte. Händels Taschen waren wieder wohlgefüllt, der englische Stolz wiederhergestellt—aber hat jemand auch nur einen Gedanken an die armen Schotten verschwendet? Your hero, friend, and father is no more. Votre héros, votre ami, votre père n’est plus. Der Retter, Freund und Vater ist nicht mehr. And with the flowing tear your cheeks bedew. Sad emblem of his country’s miseries! Et laissez vos joues ruisseler de larmes. Triste emblème des malheurs de sa patrie. Und eure Wangen mit dem Tränenstrom benetzen. Trauriges Sinnbild allen Grams im Lande! From this dread scene, these adverse pow’rs. Devant cette scène terrifiante, devant cette puissance hostile? Sont effondrées en ruines fumantes. Ach, wohin solln wir fliehen? Avec des mots qui pleurent et des pleurs qui parlent. Mit tränenreicher Rede und beredten Tränen. To the sincerity of pray’r. Exprimer notre chagrin soulage l’affliction. Ne s’abandonne pas avec désespoir à sa ruine. La sincérité de nos prières. Den Kummer auszusprechen spendet Trost. Nicht in Verzweiflung dem Geschick erliegen! Et nous rendront son Amour. Sein Mitleid, erobern seine Liebe neu. Né, sinon pour vaincre, du moins pour les sauver. Schließen sich schützend nun zusammen. Nicht zur Eroberung, zur Rettung bloß. Et nous mènera tous à la victoire. Und alle uns zum Siege führen. The cause of Heav’n your zeal demands. La cause des cieux, exige votre ardeur. Le Tout-Puissant Jéhovah fortifiera vos bras. Judas, à obéir à ton sceptre. Des Himmels Ehr beansprucht euren Mut. Wird der allmächtge Jehova stärken eure Hand. Judas, zu folgen deinem Zepter. Till kings he had destroy’d, and kingdoms won. Jusqu’à ce qu’il eût vaincu les rois et gagné leurs royaumes. Bis er die Könige bezwang und Reiche unterwarf. That triumphs in sweet liberty restor’d. Te lancer dans le conflit d’une guerre inégale. Qui en triomphe restaure la douce liberté. Te lancer dans le conflit de la guerre inégale. Die Schlacht gegen den überlegnen Feind. Das sich wiedergewonnener Freiheit freut. Pour que cette ardeur exemplaire soit bénie. Rends la liberté à ta nation Israël. Erflehen Segen für dies musterhafte Streben. Deinem Volk Israel die Freiheit wieder her. Foyer de vertu et source de délices! Et tout espoir de joie disparaît. Wohnstatt der Tugend, Quell der Freude! Viens avec toute ton escorte de joies. Toi en qui règnent les plaisirs éternels. Und bringe mit dein heiteres Gefolge. Mit der ewige Freud regiert. Tout Israël de ton ardeur héroïque! Ganz Israel mit deinem wahren Heldenfeuer! Et que la douce vie s’écoule avec plaisir. Begünstigt gar des Lebens Freuden. L’irritant fardeau de chaînes hostiles. Der fremden Ketten unleidliches Joch. To execute, oh sire, thy dread commands. Qu’endure la Judée, si longtemps insultée? Avec des cœurs intrépides et des mains vengeresses. Die unser oft geschmähtes Juda drückt? O Herrscher, deinen Willen zu vollziehn. That Thy pow’r, oh Jehovah, all nations may know. Pour que toutes les nations connaissent, Oh Jéhovah, ton pouvoir. Auf daß, Jehova, alle Völker spüren deine Macht. Cette cause glorieuse vaut bien que tu t’y joignes. Die gute Sache rechtfertigt dein Tun. Nor lust of unbounded pow’r! Ni soif de puissance infinie! Et les vainqueurs seront satisfaits. Nicht zügellose Gier nach Macht! Dependent on the Lord, our strength and shield. Et faisons confiance au Seigneur, notre force et notre protection. Vertrauend auf den Herrn, unseren Schutz und Schild. Resolv’d on conquest, or a glorious fall. Nous sommes résolus à vaincre ou à mourir glorieusement. Zum Sieg entschlossen, oder edlem Tod. Act 2 No 01. Chorus: Fall'n is the foe; so fall thy foes, O Lord! Chorus: Fall’n is the foe; so fall Thy foes, oh Lord! Where warlike Judas wields his righteous sword. Oh Seigneur! Quand le martial Judas brandit son épée de justice. Chor: Gefallen ist der Feind: so solln die Feinde fallen, Herr! Wo sein gerechtes Schwert der kriegerische Judas schwingt. With their own leader’s sword, the deathful wound. Before thee fell, with his unnumber’d host. De l’épée même de leur chef. Tomba devant toi, avec son innombrable armée. Die Todeswunde mit des Feindes eignem Schwert. Sank vor dir hin samt seinen zahllosen Soldaten. Till freedom again be restor’d. Ne peut faire face à ton épée conquérante. Avant que la liberté ne soit de nouveau restaurée. Bis Freiheit neu errungen ward. Such sweet transporting joys thy actions give. Grâce aux heureuses pensées que tes exploits nous donnent. Im Angesichte deiner wunderbaren Taten. Accordez vos harpes pour chanter les louanges. Stimmt eure Harfen für den Jubelchor. Judas! First worthy in the rolls of fame. Judas! premier dans le Livre de la Renommée. O lasset ewgen Nachruhm seinen Namen krönen, Judas! Du stehst als erster auf der Ehrentafel. „Er trug den Harnisch wie ein Riese“, heißt’s. And triumphs in her hero’s fame. Et ses exploits firent sourire Judée. Et la renommée de son héros est son triomphe. Und seine Taten ließen Juda lächeln. Und sonnt sich in des Helden Ruhm. Hail, hail, Judea. Happy land! Nous te saluons, Judée, terre bienheureuse! Le salut prospère dans sa main. Heil, Heil, Judäa, glücklich Land! Dein Wohl gedeiht in seiner Hand. Et a achevé notre merveilleux salut. Dem Himmel nur gebühren Ehr und Preis. Und unsre wundersame Rettung hat vollbracht. Se vante au combat de sa gigantesque force! Dirige et guide son faible bras. Hoch droben diese schwache Hülle lenkt. Oh Judas, oh my brethren! Ev’ry memorial of the sacred place. Oh Judas! Oh mes frères! De mémoire d’hommes tout souvenir de ces lieux sacrés. Erstehn in ihrer ganzen Grausamkeit. Jede Erinnerung an unser Heiligtum. De la plus grande joie au douloureux découragement. Von höchster Freuden Gipfel in des Jammers Tal. Pour votre destruction, mais comme châtiments. Et acceptez son châtiment comme une bénédiction. Euch zu verderben, nein, zur Züchtigung. Und wendet seinen harten Schlag zum Segen. Quand il montre sa colère. Quand la fureur est son maître et le mien, Jéhovah. Mein Schwert! Gegen den Gorgias will ich ziehn! Da ihn nur Wut treibt, doch Jehova mich.
Alliée au courage vaut une armée d’un millier d’hommes. Pour nos lois, religion, liberté, nous mourrons. Die Tapferen, die Tapfren nur zum Sammeln rufen. Wer darauf hört, ziehe erneut zu Felde! Gerechtigkeit und Mut sind tausend Mannen wert. Tun wir’s für Staat und Religion und Freiheit. Simon: Enough! To Heav’n we leave the rest. If e’er in battle Israel hopes success. Simon: Assez! Laissons aux Cieux le reste. Si Israël espère gagner la bataille. Simon: Genug! Das weitre überlassen wir dem Himmel. Soll in der Schlacht sich Israels Geschick je wenden. Dieu est notre défenseur, Dieu est notre ami. Wenn Gott uns schützt und freundlich ist gesinnt. Or, knowing, scorn’d such idol vanities. To Ashtoreth, yclep’d the Queen of Heav’n. Ne’er to delude us more with pious lies. Et son sceptre entrelacés de lierre. Ou, s’ils l’ont connu, méprisèrent des idoles si vaines. Le soir, à Ashtart, appelée la reine du Ciel. D’où elle ne puisse plus tromper de ses mensonges pieux. Reißt nieder die Altäre, die entweiht. Und seinem grün umrankten Stab. Oder sie schmähten wissend solchen Götzendienst. Der Astaroth, geheißen Königin des Himmels. Daß sie uns nicht mehr irreführt mit frommen Lügen. Ni guérir nos cœurs blessés. Elle seule peut soulager toute douleur. Noch heilen das verwundet Herz. Nur sie allein heilt jeden Schmerz. Ever obedient to his awful nod. To the rude stock or sculptur’d stone. Obéissez toujours à ses ordres redoutables. Devant les idoles de bois ou de pierre. Nous adorerons Dieu, et Dieu seul. Immer gehorsam seinem mächtigen Geheiß. Wir dienen Gott, und Gott allein. To solemnize the Feast of Lights. Selon les rites saints, la Fête des Lumières. Avec des chants de triomphante joie. Das Fest des Lichtes zu begehn. Judas Maccabaeus was a huge success at its first performance, and proved to be one of Handel’s most popular oratorios, netting at least fifty-four performances during the composer’s lifetime. Its appeal to contemporary audiences came, at least in part, from its warlike theme and high-energy arias and choruses, but the score did also contain moments of respite. For the celebration of the Feast of Lights which opens Act III, Handel produced one of his greatest masterpieces. ‘Father of heav’n’ flows serenely over an exquisite string accompaniment, with its middle section, ‘And thus our grateful hearts employ’, allowing the voice to soar into its upper reaches. The return of the opening phrase, the voice left unaccompanied, is spellbinding. Judas Macchabée eut un énorme succès lors de sa première représentation et se révéla être l’un des oratorios les plus populaires de Haendel, puisqu’il fut interprété au moins cinquante-quatre fois du vivant du compositeur. Si l’attrait du public de l’époque pour cette œuvre provenait, du moins en partie, de son thème guerrier et de ses arias et ses chœurs pleins d’énergie, la partition contient également des moments plus paisibles. Pour la célébration de la Fête des Lumières, qui ouvre le troisième acte de Judas Macchabée, Haendel produisit l’un de ses plus grands chefs-d’œuvre. «Father of heav’n» flotte sereinement sur un accompagnement intense confié aux cordes, la section centrale «And thus our grateful hearts employ» permettant à la voix de s’élever dans ses plus hauts confins. La reprise de la phrase d’ouverture a cappella est particulièrement envoûtante. Judas Makkabäus war bei der Uraufführung ein Riesenerfolg, und erwies sich mit mindestens vierundfünfzig Aufführungen zu Lebzeiten des Komponisten als eines von Händels populärsten Oratorien. Seine Anziehungskraft für das zeitgenössische Publikum lag zumindest zum Teil am kriegerischen Thema und den energiegeladenen Arien und Chorgesängen, doch die Partitur enthielt auch Momente der Ruhe. Für die Begehung des Lichterfests, mit dem der dritte Akt von Judas Makkabäus eröffnet wird, brachte Händel eines seiner größten Meisterstücke hervor. „Father of heav’n“ fließt heiter über eine vorzügliche Streicherbegleitung, wobei der Mittelteil, „And thus our grateful hearts employ“, der Stimme gestattet, sich zu den obersten Lagen aufzuschwingen. Die Rückkehr der Eröffnungsphrase, bei der die Stimme ohne Begleitung bleibt, ist fesselnd. In spiry streams pursue the trailing smoke. Sure presage that the Lord hath heard our pray’r. And Judah’s daughters taste the calm of peace. Tortur’d at home, or havock’d in the war. A la suite des spirales de fumée. Sûr présage que le Seigneur a entendu notre prière. Que les filles de Judée goûtent le calme de la paix. Désolées au foyer ou ravagées par la guerre. Hochauf dem Rauch, der abzieht, folgen. Sicheres Zeichen uns, daß Gott sein Volk erhört. Judäas Töchter lasse Ruh und Frieden kosten. Gequält daheim oder im Krieg gemetzelt. In the pure strains of Jesse’s son. Dans les purs accents du fils de Jessé. So rein, wie vordem sang Isais Sohn. Met, fought, and vanquish’d all the rageful train. That threaten’d desolation to the land. Vint, lutta, et vainquit cette masse enragée. Aux victoires non encore remportées. Qui menaçait de ravager notre terre. Traf, focht und schlug den ganzen wütgen Troß. Für Siege, die noch unerkämpft. Die mit Verderb bedrohten unser Land. Chorus of Youths: See, the conqu’ring hero comes! Chorus of Virgins: See the godlike youth advance! To deck the hero’s brow divine. Chœur de jeunes gens: Voyez, c’est le héros conquérant! Préparez les divertissements, apportez les lauriers. Adressez-lui des chants de triomphe. Et de roses pour ceindre le front du divin héros. Chor der Jünglinge: Seht den Siegeshelden kommen! Chor der Jungfrauen: Seht den schönen Jüngling kommen! Des Helden göttlich Haupt bekränzt. To crown this conquest with unmeasur’d praise. Pour couronner cette victoire de louanges sans fin. Mit unbemessnem Lob den Sieg zu krönen. To Israel’s Lord and King. The stabbed monster, triumph’d in a glorious death. Au Seigneur et Roi d’Israël. A ceux qui, courageusement, sont tombés à la guerre. Succomba sous son poids, triomphant dans une mort glorieuse. Für Israels Gott und Herrscher. Der vielen, die im Kampfe mutig fielen. Von dem durchbohrten Untier siegt er noch im Tod. De bonheur sur la terre, ou de félicités dans les cieux. Zur selgen Erde sich, zum seligeren Himmel. Peace to my countrymen; peace, and liberty. To curb the proud, and set the injur’d free. Du grand Sénat de la Rome impériale. Pour restreindre l’agresseur et libérer les agressés. In Frieden seid gegrüßt, Landsleute, und in Freiheit. Komm ich mit dem Gelöbnis guten Einvernehmens. Die Hochmütgen zu zähmen und befrein die Unterdrückten. That grateful hearts can send from earth to Heav’n. Que la gratitude des cœurs peut adresser aux cieux. Den Herzen je empor zum Himmel sandten. Dont notre héros et notre ami est digne. Dans une joie sans fin et un bonheur tranquille. Preiswürdig ist uns unser Held und Freund. In süßer Ruh, in sanfter Liebe, grenzenlosem Glück. And valleys smile with wavy corn. But nature’s songsters wake the cheerful morn. Et les vallées de l’ondoiement des blés. Que celui des oiseaux n’accompagne la joie du jour naissant. Laß deinen Segen allen angedeihn. Im Tal das wogende Getreide lächeln. Als Vogelsang erwecke nun den jungen Tag. Dans l’harmonie de chants divins. Mit Cherubim und Seraphim stimme harmonisch ein.